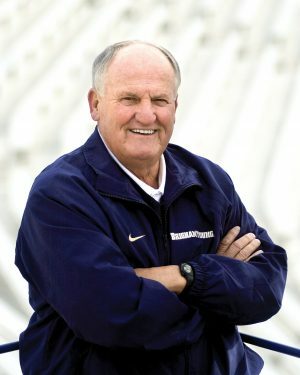 LaVell Edwards successfully combined football with raising a family. His wit, warmth, and wisdom made him a father figure to players and fans too. Photo by Mark Philbrick. The sideline image of Coach R. LaVell Edwards (PhD ’78)—arms folded, brow furrowed, mind focused—is burned into the collective memory of BYU fans everywhere. Edwards had a plan for BYU football and made it happen for 29 seasons—with 20 conference titles, 22 bowl appearances, and a national championship to show for his efforts. His players respected him, the collegiate hall of fame inducted him, and BYU honored him by putting his name on the stadium. His peers called him “honest,” “a true giant,” and a man who “loved his players like a father loves his children.” He died at the end of 2016, age 86, with more honors than this page can contain. He stood—and stands—as a father figure to the entire BYU community, not just his players and coaching staff. Students and fans, too, saw in him a kind of patriarchal wisdom, even temperament, and constancy. His quick wit and good character made people feel like they knew him, and his warmth and ability to make friends endeared him to many. Now this caring mentor and great competitor has been chosen as the BYU Homecoming 2017 honored founder. LaVell Edwards won a lot of games, but he won even more hearts and friends. “He never let his competitiveness overtake who he was,” says James. “As good a coach as he was, he was a far better father. Dad always put the person first.” LaVell’s good name is attached to the stadium and to the hearts of BYU lovers everywhere. He embodies the Spirit of the Y in a personal, unforgettable way. After 29 years at the helm of BYU football, LaVell Edwards has retired, leaving fans a legacy of memories. Three former players—Young, Holmoe, and Matich—offer tributes to the coaching legend.